I use the word “essential” in its most literal and fundamental definition. Not as in, I’m the best chef or the most original chef or the most creative chef or anything close to that. But rather, I can cook the essentials. I can put together enough full meals off the top of my head to go a couple weeks without repeating one. I can work my way through a lot more than that if given time and a recipe. Put simply, I won’t eat like crap and I won’t go hungry. That clarification and blunt transparency is important because it is the singular motivation behind this entire post: You don’t need to be that skilled or even knowledgeable to make not only edible, but tasty and, when you wish, healthy food. 1. A steak of your choice – It doesn’t need to be from a pricey butcher or even Whole Foods. Just check your local grocery store. It’s possible to find decent Ribeyes or New York strips around $10. I’ll what until they’re on sale and get them for around $8. 2. Extra virgin olive oil – Yes, some are better than others, but just pick one. Remember, this is steak for a lazy cheapskate. 3. Fresh garlic – What until that smells up your kitchen. Mmmm. 4. Oregano – Because I enjoy the smell and flavor of the herb, and because this is just how you do it when your grandfather comes from Greece. 6. Just a little butter – Shhh. This is a secret. At least a few hours before you plan to cook your steak – ideally, you do this the night before – take it out and gather your ingredients. 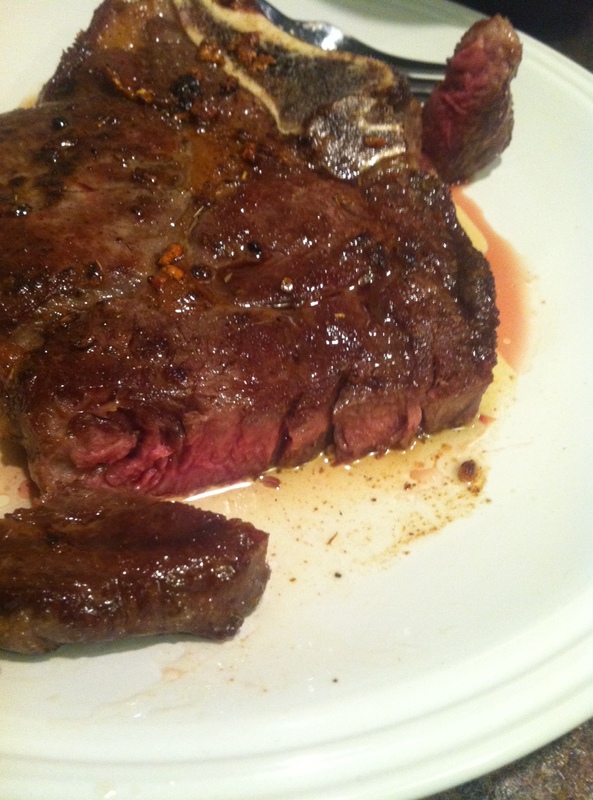 Pour some olive oil on the steak, and massage it into the crevices of the meat (don’t forget the sides!). Do this to both sides. Now this is where it gets REALLY tricky. You’re going to take a healthy amount of salt, pepper, oregano and fresh garlic (use a garlic press) and rub it all over the steak until you’re so hungry you don’t even want to cook the damn thing, but rather put your hands behind your back and get after it like you’re bobbing for apples. Do this to both sides. Nothing can beat a steak grilled over an open fire, but if you’re a lazy cheapskate, you probably don’t have that kind of set up to begin with, and if you did, you probably aren’t lighting wood and waiting for it to crumble down into beautiful cooking embers. So on your stove top, set a medium-high fire — about an 8 on the stove dial – and let a skillet of some kind (no, cheapskate, it doesn’t need to be cast iron) get really hot. Pour some olive oil into the pan, swish it around so the surface is covered, and then lay your steak in the pan and enjoy the sweet sizzle. The best part about this, you lazy cheapskate you, is that you literally don’t have to do anything now for three minutes. Seriously. You don’t even have to watch your steak. I would, because a steak working it’s way to medium-rare is one of the world’s pure and simple pleasures, but you don’t have to. You could watch TV, grab a beer, whatever. But you DO need to pay attention to the clock. After three minutes, flip the steak over (ahh, more sizzling). If your heat was high enough and your skillet hot enough, you’ll have the makings of a nice crust on the side that’s facing up without your steak being cooked through. Now take a little of that butter – however much you like – and spread it onto the top of the steak, letting it melt into the meat. You have another three minutes of down time. Hopefully, you plan on having at least some sort of vegetable. If I’m feeling really lazy, I’ll prepare a big spinach salad with tomato, red onion and balsamic vinaigrette dressing. It’s easy, it’s healthy, and you can easily wash, chop and combine everything you need into a bowl in the six total minutes of down time you have while your steak is cooking. After the second three minutes is up, flip the steak back over – now the buttered side is going to sizzle again – and spread a little butter on the other side. Let the steak sit for 60 seconds. The butter meeting the pan is going to finish off the deep brown crust you want on your steak (not charred – that’s called “burnt”). 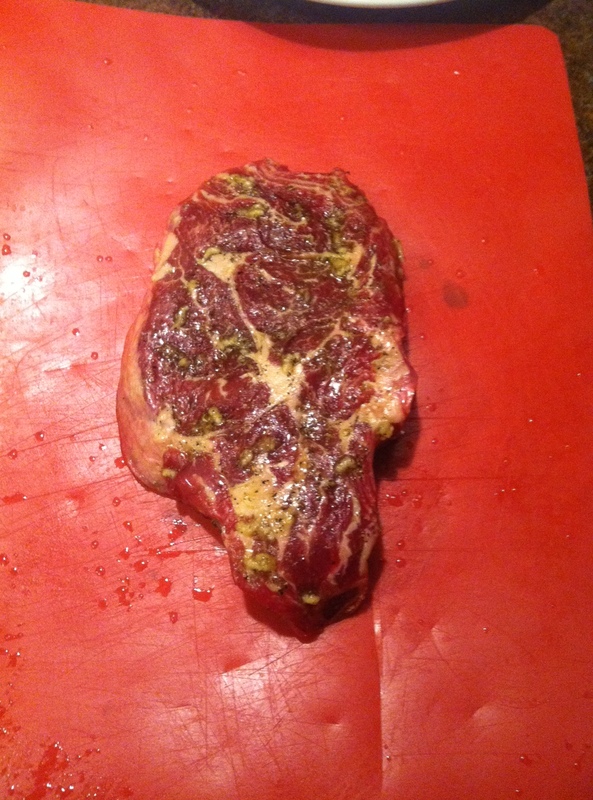 Then flip the steak back over so the second buttered side gets its 60 seconds to finish. Note: This isn’t the same steak as the one pictured above. Cooked a few different ones and had various pics. Total dollars spent: We’ll call it $11, with the caveat that everything purchased, except the meat obviously, will last you many times over. Total time spent: 16 minutes (three marinating, eight cooking, five resting after taking it off the fire). The steak pictured here came off actually a touch too pink in the center for my optimal liking – I like my steaks medium-rare, but closer to medium than rare (if that makes any sense). I could have used another 30 seconds or so on each side. But that’s why we experiment. You keep trying until you get it just right. This entry was posted in Uncategorized and tagged Beef, Cooking, Dining, dinner, Food, Meat, Recipes, Steak. Bookmark the permalink.